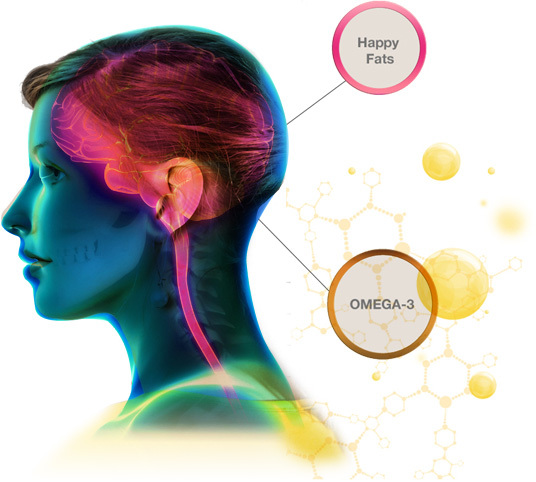 Psychiatrists refer to the Omega-3 fatty acids in OmegaGold as “Happy Fats”. Why? Because they’ve long been studied and proven to have a positive healing effect on a number of mental health ailments, including neurosis, dementia, depression and even suicidal thoughts. The brain is composed of 60% fat ? including the Omega-3 fatty acid DHA. As a result, a brain deficient in DHA is more likely to spiral into illness. DHA and other Omega-3s act as “Happy Fats” ? and deficiencies can often lead to violent, depressed and suicidal thoughts. DHA is also linked to memory preservation ? particularly in seniors suffering from memory loss and dementia. Omega-3s are perhaps best known for their positive impact on cardiovascular health. In fact, the fascination with Omega-3s began when scientists discovered Greenlanders’ astonishingly low rates of cardiovascular disease. After careful study, the connection between health and a diet rich in Omega-3 packed seal oil was made. 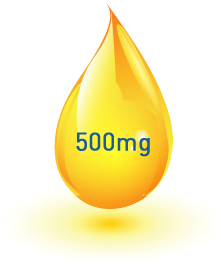 If it causes skin irritation or allergic reactions, rinse off and discontinueStudies have shown that the Omega-3’s found in OMEGAGOLD can help to reduce the amount of cholesterol and saturated fatty acids in the blood – and, as a result, help to reduce the amount of dangerous clotting and closing of the life-sustaining veins leading into and out of the heart. What’s more, Omega-3 fatty acids can help to raise the amounts of good cholesterols in the blood and even help to regulate blood sugar and insulin levels in some patients when taken as part of a healthy diet. WHAT MAKES THESE FATTY ACIDS SO ESSENTIAL? Omega-3 fatty acids are called ‘Essential Fatty Acids’ (EFA) because they benefit our health in immense ways – but our body is unable to produce them. That’s why it’s important to seek out the purest and most potent sources available. 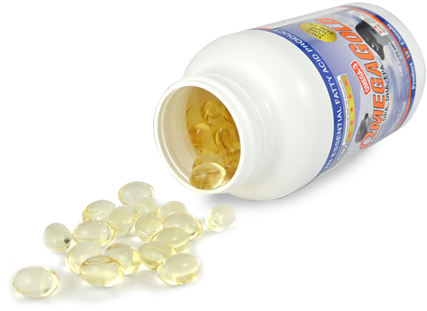 OMEGAGOLD Omega-3 capsules are produced by GMP (Good Manufacturing Process) certified and licensed facilities in Newfoundland, Canada. Our facilities also meet and exceed the CFIA (Canada Food Inspection Agency) Regulations and our product meets and exceeds the Health Canada Regulations for production and export. Refining seal oil is a very mild process – much milder than what is needed to refine fish or vegetable oils. 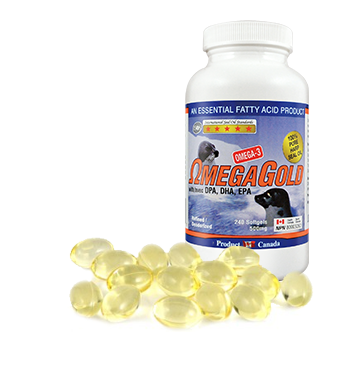 In fact, because no high temperatures are required to render fatty acids from seal blubber, the Omega 3 fatty acids in OmegaGold capsules is more pure and more potent than any you’ll find in fish oil supplements. Made purely from seal oil, no chemical process is used to make our capsules. This means the Omega-3 fatty acids in OMEGAGOLD capsules are more pure and more potent than any you’ll find in fish oil supplements. One of the essential functions of Omega-3 is to help cell tissues to carry various substances – that are absorbed, and filtered in the cells – to the places where they are needed most. Omega-3s within theses tissues act as a gatekeeper of the cells, by letting desired substances enter and keeping undesirable substances out. Because Omega-3 and Omega-6 compete to synthesize in cell tissues or phospholipids, Omega-3-containing tissues can work to prevent the unwanted and potentially life-threatening inflammatory effects of Omega-6. Arthritis is an inflammatory disease in joints and Omega-3’s efficacy against the pain associated with the ailment – particularly when taken in conjunction with Naproxen – has been encouraging. 11.2% of Canadian infants suffer from asthma and it costs hundreds of millions annually to treat. However, studies have shown a connection between the DHA found in breast milk and in Omega-3 supplements like OmegaGold and an up to 30% lower probability of developing the ailment. Cancer is still the leading cause for death worldwide. However, multiple studies on the anti-inflammatory effects of Omega-3’s as well as the Essential Fatty Acids’ ability to reduce the buildup of tumor-creating prostacylin have lead scientists to believe it’s a key preventative and treatment aid against cancers. is responsible for the manufacturing of OMEGAGOLD and they take full responsibly for their claims.